Fished south again today. 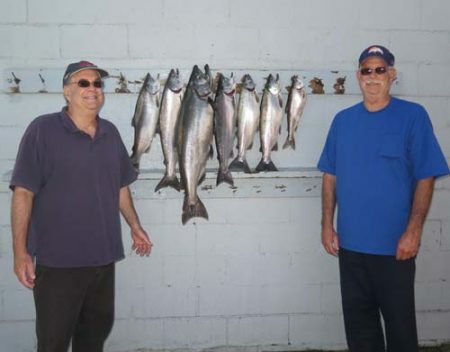 We had 15 rods set before a Coho took a Captain’s Choice Natural Glow plug on a 225 copper. It went again later in the morning but we didn’t get the fish. 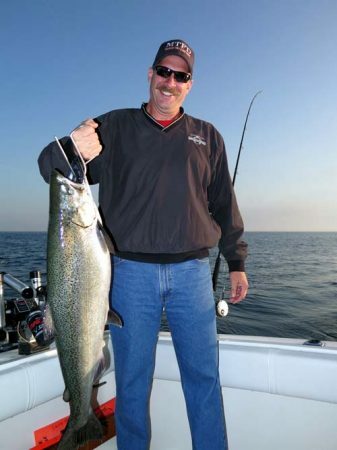 The big King pictured above hit a regular size DW Green Skinny Jeans on a 225 copper. We took another Coho on a 300 copper with a regular size DW Raspberry Carbon. Our high wire divers were our best rods today. 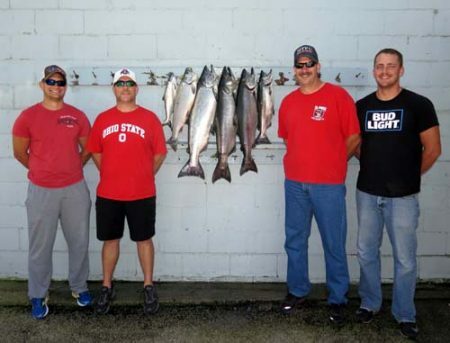 The starboard high out 285 with a 10″ White Slick Spin Doctor/Pickled Sunshine Dreamweaver Meat Rig went 3 times and a 10″ Yellow Sparkler Spin Doctor/Cold Steel Big Water Meat Rig out 250 went 4 times on our port high diver. We took 1 of our bigger Kings on a low wire diver out 165 with an 8″ Chrome Killer Spin Doctor/Green Mile Dreamweaver Meat Rig. With the exception of 2 bumps on an out down set at 80 feet with a pair of DW Blue Skinny Jeans we didn’t have any rigger action. We have the next 2 days off and weather permitting will be back on the water Saturday. We use Dreamweaver Premium Strips in all our meat rigs, Morgan’s Tackle copper on all our copper rods & Morgan’s wire on all our wire rods. We fished south today setting up in 140 feet of water. It was just breaking daylight when the reel on a 300 copper with an 8″ Kevin’s Girlfriend Spin Doctor/Liquid Sunshine Action Fly started screaming out line. I was glad we had had a good spool knot. The fish took out all the line on a 800 Tekota and when it got to the end we locked the drag down and it broke off at the bait. Before we could get all the copper back in we took a Coho on a regular Blue Skinny Jeans 85 down on an out down. We took a Coho and lost one on the same spoon later in the morning. The big King pictured above came on a regular size Raspberry Carbon spoon on a 300 copper. 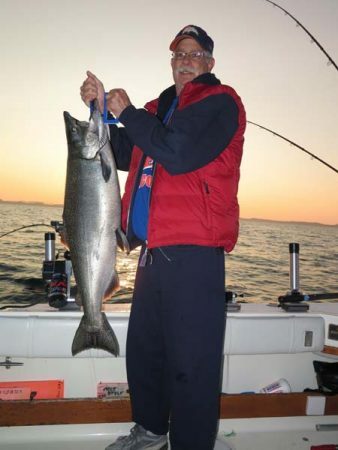 A 10″ White Slick Spin Doctor/Pickled Sunshine Dreamweaver Meat Rig out 270 on a high wire diver took a King and we took a Coho on a low wire diver out 150 with an 8″ Chrome Killer Spin Doctor/Green Mile Dreamweaver Meat Rig. We took a Trout and lost another one right at the back of the boat on a 10″ Chrome Spin Doctor/Chrome Blue WhirlyGig with glow wings fished on the bottom in 150 feet of water. Our last fish came when we were pulling line on a 225 copper with a regular size Green Skinny Jeans. We use Dreamweaver Premium Strips in all our meat rigs, Morgan’s copper on all our copper rods & Morgan’s wire on all our wire rods.